Sherri-Ann Grant-Clarke is an associate in the firm’s Coral Springs office. Ms. Grant-Clarke received her Bachelor of Arts degree from the University of Central Florida. While at UCF, she was an active member of the student body and served as a Judicial Advisor in the Student Government Association, Student Director of the Multicultural Student Center, Student Representative of Knights of Roundtable, Mentoring and Literacy Director of Volunteer UCF, Member of the Student Conduct Board, Member of Phi Alpha Delta International Law Fraternity, and member of Delta Sigma Theta Sorority Inc. 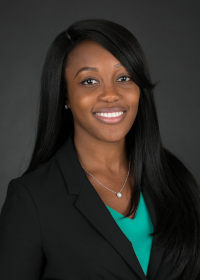 Following her undergraduate studies, Ms. Grant-Clarke matriculated at The Florida State University College of Law where she was a member of Phi Alpha Delta Law Fraternity, Stafford Inns of Court, Black Law Students Association, semi-finalist at the Southern District Regional Frederick Douglass Moot Court Competition, and Judicial Extern to the Honorable Don S. Cohn of the Eleventh Judicial Circuit. Ms. Grant-Clarke is admitted to practice law in Florida and before the United States District Court of the Southern District of Florida. She is a member of the Jamaican American Bar Association, American Bar Association, and Miami-Dade County Bar Association. Her areas of litigation practice include premises liability, automobile negligence, general negligence, and construction litigation.